Melbourne river cruises go up or down the Yarra, or both. Upriver you get to see the parklands, sporting arenas and Herring Island. This is the more relaxing scenic part of the Yarra. Downstream, with the river widening into the bay, you get the steel and glass docklands, the massive bridges and the Port – all very impressive! A Melbourne river cruise is a great way of enjoining the sights –we often do this with our visitors. You have the choice between regular or dinner cruises, or the Williamstown ferry across Port Phillip Bay to Williamstown - and there is even a Melbourne New Year’s Eve Party Cruise. The Spirit of Melbourne Dinner Cruise is one of the most popular and highly rated Melbourne cruises. It is top class, luxurious and romantic. You get a three hour cruise, and a six course meal with great wines and great service - while gliding by and watching the city light up. You have a choice between Eye Fillet, Salmon, Chicken, Kangaroo or Vegetarian main course. We highly recommend this for any special night out. The Highlights of Melbourne Cruise is an affordable 2 hour cruise that takes you both up and down the river. You get to see the scenic Yarra river vistas, Hering Island, as well as the Docklands and port. The captain is an interesting character giving you a commentary of historical titbits and facts. The cruise runs at various times during the day. The River Gardens Melbourne Sightseeing Cruise is a one hour cruise up the Yarra where you get to see the scenic gardens and parklands, Herring Island, as well as sporting areas. It is a basic, but lovely relaxing trip. The one hour Port of Melbourne and Docklands Sightseeing Cruise goes the other way. You will get some interesting information about the settlement and history of Melbourne. The port is very impressive with its huge cranes and picturesque in its own way. The Melbourne City to Williamstown Ferry is popular and the start for a great day out. It goes past the Docklands and Port, and you are able to spend a relaxing day in the historic town of Williamstown – great foreshore, cafes, shops and galleries. The ferry one way takes nearly one hour. You can book it one way (and return by train), or return. 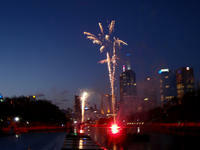 Throughout the year there are also some Yarra Cruises for special events. The Christmas Lunch Cruise takes you for three hours along the Yarra with traditional and modern Christmas culinary specialties - withouth the endless cooking and cleaning... Ideal for a family and friend Christmas. Every New Year Eve you have the fantasic opportunity to watch the Melbourne fireworks from the Yarra via a New Year's Eve Party Cruise - one of the best ways of being in the middle of it all. The cruises are divided into 18-35 and over 35 year olds, giving you the opportunity to hang out with likeminded people. There are two price options. Both include dinner and drinks, entertainment. For something a bit more mellow, the New Year's Eve Dinner Cruise also gives you the premier view of the fireworks from the Yarra - over a three course meal, premium wines, beers and spirits. This is where you can dance into the New Year to golden oldies, popular and contemporary music. Spoil your Valentine with a romantic Valentine's Day night cruise on the Yarra. This intimate Yarra River Dinner Cruise is on every Valintine's day, Feburary 14, and can be booked at the beginning of the year. It includes a 5-course dinner and unlimited premium Australian wine, beer, soft drinks and spirits. This is the perfect way to spend an unforgettable night that your Valentine is sure to love. This Melbourne Sights & Optional Yarra Cruise is a morning bus tour that gives you a good overview over Melbourne – and knowledge where to go back to and what interesting things there may be to explore. It is a good option for people not having much time in Melbourne and wanting to see a lot. You can add a one-hour Yarra cruise to this tour. Melbourne City Tour, Yarra River Cruise and Great Ocean Road Day Trip is brilliant if you want to take as many greater Melbourne memories home with you as you can and don’t have much time. It includes a one hour Yarra cruise, Melbourne attractions and the Dandenong Ranges on the first day. On the second day a whole day tour down the Great Ocean Road.